We have obtained an astounding number of placements for our clients in recent months including four front page Journal News stories, Associated Press and Reuters Coverage, as well as The New York Times. See below or visit our gallery of PR Placements. Our client Michele Phillips was fabulous on CBS talking about keeping those New Year's Resolutions! We got our client, The Westchester Fine Craft Show, on the cover of the October 2012 Hook Magazine and an article inside. We have secured over 100 placements for this show since being hired in May. Our client JoeShopping.com featured in the regional business publication. November 6th Daily News article on Bounce! Trampoline Sports! Morton's The Steakhouse Featured on CBS November 16 helping United for the Troops! GMG Public Relations has generated thousands of media placements for its clients. GMG Public Relations has generated top public relations placements in leading business publications for its clients. Dary Rees has turned to GMG Public Relations for marketing and public relations support for nearly 20 years. GMG Public Relations is a leading marketing and public relations agency. A good example of our creativity is our “news conference in a box,” which won Best of Show from the Advertising Club of Westchester. We were asked to generate business coverage for Ms. Rees’ home products company in anticipation of going public. We dug around and found that she had used a little-known government program to expand overseas. We used that angle and created a “news conference in a box.” We filled it with a bottle of champagne, one of her fun champagne glasses, cheese and crackers, one of her colorful cheese spreaders and a press kit. Follow up was easy as most of the publications called us! There were over 320 entries for the Ad Club Awards. We were chosen unanimously because our “news conference in a box” was not only unique in its execution, but was successful for the client, garnering a 41% placement rate, including Fortune, Entrepreneur, Success and Executive Female. The Scottish tourist board (VisitScotland) enlisted our services to help promote Tartan Day in the United States and the world’s largest pipe and drum parade to raise money for Marie Curie Cancer Research and Gilda’s Club Worldwide. The goal was also to increase awareness of travel to Scotland. Our efforts garnered a feature story on CBS's Sunday Morning covering the evolution of the kilt. The story highlighted scenes from Edinburgh, an interview with the best-known kilt maker in Scotland as well as an interview with actor Sir Sean Connery. The piece was viewed by more than 4.5 million people. We arranged additional interviews with Travel & Leisure, Travel Agent, Bride’s and Bridal Guide all featuring travel to Scotland. Tartan Day was a huge success in the United States with nationwide media coverage including several morning shows and news broadcasts. Providing public relations and marketing support for small firms, non-profit organizations and entire countries. When tourism suffered because of foot and mouth disease, The Scottish Tourist Board again turned to GMG for assistance. They gave us 60 days to obtain as much press as possible about positive tourism events in Scotland. In 60 days we obtained more than 900 radio placements and well over 200 newspaper and magazine articles including four placements in The New York Times. Radio is alive and well! We had two clients on Radio shows recently! During our eight year contract with this 140-year old elder-care facility, we generated thousands of placements including coverage on all the major New York area television news networks. For the opening of their assisted living residence we wanted to highlight their attention to detail, so we mailed green-polka-dot boxes to the media that 'begged' to be opened. Inside were a plain Idaho potato and a cover letter explaining how ‘residents will never find anything other than fresh vegetables at The Wartburg.’ That promotion garnered a coveted New York Times story along with several local media placements. We generated a feature story in The New York Times every year while working The Wartburg. The Wartburg Adult Care Community turned to GMG Public Relations for nearly a decade to support its health care marketing and public relations efforts. GMG Public Relations provides outstanding marketing support for health care organizations. GMG Public Relations has contacts with leading media including The New York Times. GMG Public Relations demonstrated so much creativity that when AMC/IMAX needed to open a new theatre in New Brunswick, NJ, they chose GMG Public Relations over numerous large Manhattan agencies because they knew they would get hands-on support as well as the kind of creativity that can only be generated by a boutique agency. GMG Public Relations has been providing creative public relations support for the IMAX Theatre since 1999. GMG Public Relations has provided a decade of creative marketing strategies for the IMAX Theatre. GMG Public Relations goes to great lengths to provide creative public relations and marketing support for its clients regardless of their size. Providing award-winning marketing creativity that increases the bottom line is what our clients appreciate most. In ten days we organized an entire summer of activities to increase ticket sales at an area IMAX Theatre. We managed to secure eight summer Saturday activities for kids, including a Broadway star to teach jazz dance, a laser tag game, gymnastics and kickboxing demonstrations and a junior-challenge obstacle course. We generated attendance through a grass-roots approach of distributing flyers by hand to the public and mailing out press releases to the media. We also partnered with a party company that agreed to distribute 5,000 balsa-wood airplanes with “IMAX Action Summer” printed on the wings and coupons for IMAX tickets included in the packaging. Not only did the media cover the event, but there was a significant increase in ticket sales overall. To extend the coverage we recommended that IMAX donate 10 cents of every ticket purchased to Special Olympics. The summer promotion raised over $7,000 to support Special Olympics athletes in the area. Our job is to not only make sense of the marketing vehicles available to our clients but to maximize them in a way that makes our clients stand out. EastRidge Properties wanted a fun idea to launch the first freestanding day care center within an office park in Westchester County. We suggested they create the longest paper-doll chain on record and use it in place of a ribbon to cut on opening day. We then carried that theme through by making invitations for the media out of paper-doll chains, and putting images of paper-doll chains on T-shirts and coloring books for the kids. We then located 100 feet of rolled paper and began carefully cutting the chain. The children finished it by drawing their images on each paper doll. The mayor and the children cut the paper-doll chain in front of a cheering crowd on opening day. The promotion received huge press coverage and a letter of recognition from the Guinness Book of World Records. We also assisted EastRidge with their efforts to create a “tenant cookbook” with all the proceeds going to charity. More than 100 wonderful recipes were submitted and a wire bound cookbook was created and sold throughout the Westchester community. We chose a small charity that wouldn’t normally benefit from such a large corporate effort and every dollar from book purchases was given to HeartSong generating more than $5,000 in donations in one month. We have gotten our clients numerous top media placements including stories on CNN. Dr. Joanne Chan, a recipient of a 2003 Kimmel Scholar grant, was interviewed on CNN Headline News by Richard Frazier. 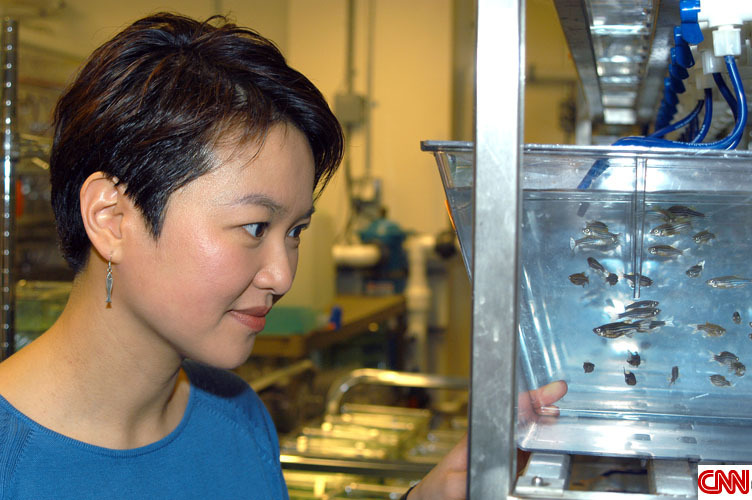 During the 4 minute interview they discussed her work with zebra fish that will ultimately help identify drugs that will be effective in humans to fight cancerous tumors. Our recent audio news release produced as a public service announcement for the Kimmel Foundation was aired on nearly 2,600 radio stations nationwide with an audience of nearly 50 million people. The AP story we recently generated for the Sidney Kimmel Foundation for Cancer Research has received over 200 newspaper placements nationwide in addition to numerous web placements reaching an audience of well over 8 million people. The Sidney Kimmel Cancer Center in San Diego recently received numerous national broadcast and print placements of their cancer breakthrough including stories on ABC, NBC, CBS, FOX and the WB. On March 2, 2005 the Sidney Kimmel Cancer Center in San Diego was the subject of a front page feature article in the Quest section of the San Diego Union-Tribune. Generating visibility in a crowded field takes strategy, creativity and consistent implementation; this is what GMG Public Relations is known for. We specialize in getting our clients placements in the media that matters most to their target audiences. Finding a good story within our clients' organizations is a technique we employ to generate more interesting pitches for the media. Tip articles are a great way to put your business in the spotlight. This article was created for A & J Reliable. Writing tips articles is a great way to generate media coverage both online and offline. In addition to being the subject of feature articles, our clients are often quoted in larger articles. Below is an example in USA Today. Generating coverage in USA Today is a difficult task, one that we welcome! A top traditional media placement for our clients is often a marketing goal. Media placements across the country are something we strive for with national clients. Clients Keith and Angela Burns were thrilled with their USA Weekend article which took up two full pages in the publication. USA Weekend reaches an audience of 21.8 million people and has an full page ad rate of $477,000. Top media placements are something we strive for with most clients because of the prestige they represent even in today's wired world. We recently placed this article in the Orange County Register (CA) for our client Laughing Owl Music and Media. The nearly full page article would have cost over $48,000 if it had been an advertisement. The OCR is read by nearly 1 million people on Sundays. A good placement will generate thousands of website hits as this one did. On November 25, 2006 a story written by an Associated Press journalist that included a quote from our client Clyde Otis III began appearing in newspapers across the country. In less than 24 hours MusicTalking.com received over 6,000 hits on their website and their CD began selling at the rate of one every ten minutes. Over a period of 9 days the article appeared in nearly 200 publications worldwide. A previous AP story we placed for another client generated over 150 placements in newspapers across the United States over a one month period. The first AP story was the result of a direct pitch we made regarding our client. The more recent AP story was a result of our response to a journalist query through our on-line query database to which we subscribe. August 2008: Our work with Canvas Corp. over a 14 month period generated numerous high profile placements including Bankrate.com, Los Angeles Daily News, Denver Post, Giftware News, HGTV Marketplace, Minneapolis Star Tribune, Modern Home, Reuters, San Francisco Chronicle, Small Room Decorating, Cincinnati Enquirer, Today's Creative Home Arts, Westchester Home and The New York Times. The approximate equivalent ad value of the known placements is over $150,000. Getting coverage in The New York Times is often a top priority for our clients and we strive to meet that objective. Trade publication articles are a great way to reach a targeted audience. We have been working with Morton's since 2006 and during that time have generated hundreds of placements in print and on-air in the New York tri-state area. 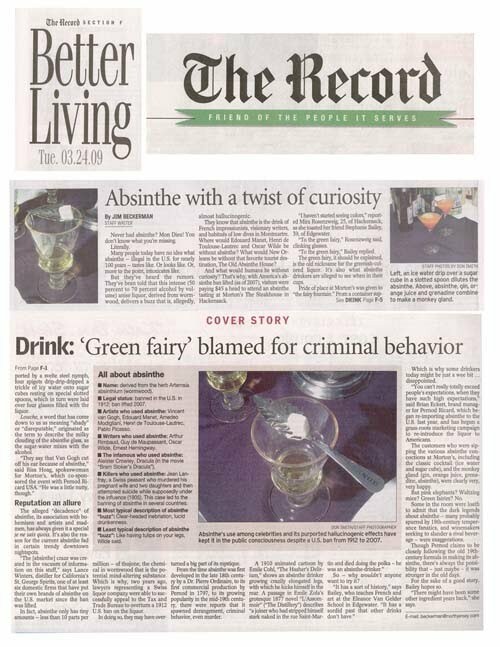 Their recent introduction of Absinthe to the beverage menu generated a great deal of interest including full page coverage in the Westchester Business Journal in March of 2009 and the article below appeared in The Record (Bergen County) on March 24, 2009; value of the clip below is over $14,000. Getting top regional media coverage for Morton's The Steakhouse is a priority for our team. Making a product local often leads to coverage for national organizations. We were recently asked to support a new campaign for Big Brothers with a big kick-off event. We combined two clients and held the kick-off in front of Morton's The Steakhouse in Brooklyn. Cablevision supported the event and sent Neighborhood Journal to cover it. Here's another link to a February DM News article we obtained for Magjak. We have worked with the IMAX Corporation for over a decade. Here's a clip from a recent AMC IMAX Theatre opening we assisted with in September 2009. AMC/IMAX turned to GMG Public Relations over larger Manhattan agencies when they needed hands-on, creative marketing support for a new theatre opening. Coordinating dignitaries for the benefit of our clients is something we enjoy doing. The Mayor of New Brunswick, Jim Cahill, assists Bernie Anderson with the ribbon cutting for the new AMC IMAX Theatre in New Brunswick. Risa poses with Greg T. of the Z100 Morning Show for the opening of the AMC IMAX Theatre in New Brunswick. Risa Hoag with Greg T. of the Z100 Morning Show at a personal appearance for the opening of the new AMC/IMAX Theatre in New Jersey. Celebrating an anniversary is a great reason to generate some PR. 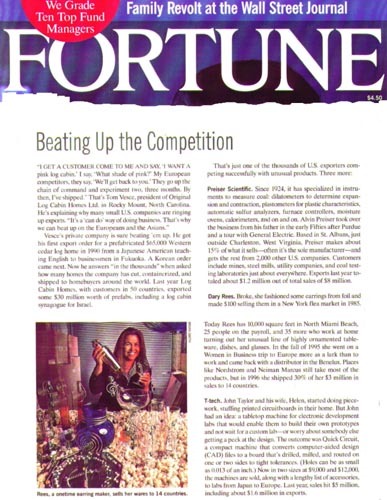 Below Sharon Decker, owner of Eye Designs in Scarsdale, is featured in the December 14, 2009 issue of Westchester County Business Journal for her 25th anniversary in business. Getting your company featured in the newspaper is more easily accomplished when you have a good story to tell. Sharon Decker was able to address the changes in her industry over a 25 year period which garnered a half page feature story. Getting our clients quoted as the leader in their industry is a top priority. Below, Sharon Decker, is quoted in January/February 2010 issue of The Westchester WAG in an article about the latest trends in eyewear. Get yourself quoted as an expert in order to increase visibility. This works on line, but it also works in old-fashioned print media as well. Risa B. Hoag, President of GMG Public Relations, Inc. in Nanuet, recently covered a wine tasting dinner as photographer for her client Morton's The Steakhouse in Hackensack. Featured guest for the dinner, Michael Mondavi founder of the Folio Wine Group, turned the tables and asked Risa to appear in a photo with him. From left to right, Michael Mondavi, Risa B. Hoag, Tylor Field, Morton's Vice President of Wine & Spirits, and Chad Alvis, General Manager of Morton's The Steakhouse in Hackensack. The dinner was a fundraiser for Feeding America. Risa Hoag is a marketing and public relations leader providing her clients with hands-on marketing advice to help them navigate the current media landscape.